Redshirt freshman Jason Shelley will make his first start Saturday vs. Oregon. Travis Wilson and Troy Williams may not be remembered among Utah’s greatest quarterbacks, but they are the only two in the program’s Pac-12 history to last a full conference season as the starter. 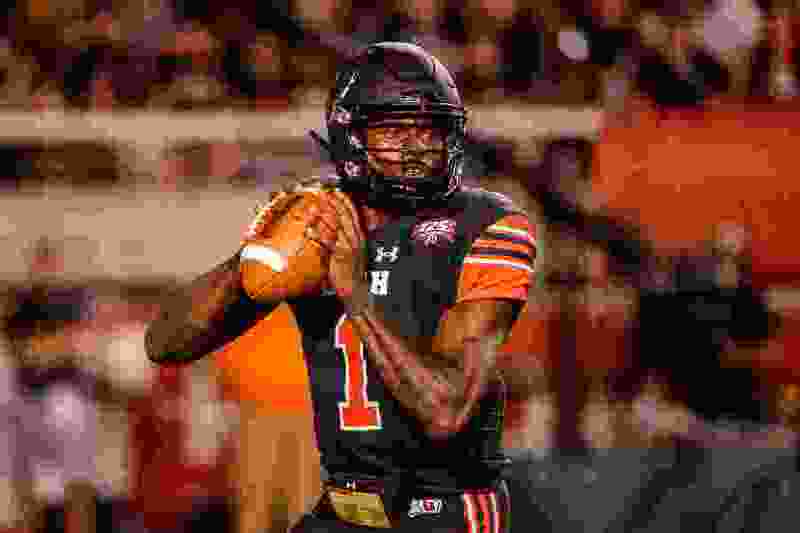 Tyler Huntley's absence marks the sixth time in eight seasons that Utah has needed a replacement for multiple conference games at the QB position, due to injury. Utah coach Kyle Whitingham did not clarify the nature of Huntley’s injury, which is reportedly a broken collarbone. He allowed for the possibility of Huntley’s returning for a bowl game, depending on when and where Utah is assigned (only one of the Pac-12′s affiliated games, the Las Vegas Bowl, is scheduled before Christmas Day). Oregon quarterback Justin Herbert was sidelined for six weeks with a fractured collarbone last season; the Ducks beat Utah 41-20 without him, rushing for 347 yards. Huntley’s injury was especially tough to have happen to a player who “loves football as much as he does” and is “just so passionate about what he does,” Whittingham said during his weekly news conference. Shelley’s starting debut Saturday vs. Oregon will make him the seventh backup quarterback that Whittingham has promoted in the Pac-12 era, counting one switch attributed to inefficiency. As of mid-August, the likely scenario if Huntley got hurt was for highly regarded freshman Jack Tuttle to become the starter. Shelley altered that script by beating out Tuttle for the No. 2 job in preseason camp. The depth chart changed in mid-October when Tuttle withdrew from school, intending to transfer. So in less than three weeks, former walk-on Drew Lisk has gone from No. 4 to No. 2, and nobody is No. 3 — although one of two ex-high school QBs, receiver Britain Covey or linebacker Chase Hansen — will be prepared for emergency use. A redshirt freshman from Lone Star High School in the Dallas-Fort Worth area, Shelley was a four-year starter for the Rangers and led the team to the Class 5A Division II state championship game as a junior. “He transformed our program,” Lone Star coach Jeff Rayburn said. Utah is not making Shelley available to the media this week. In the Utes' first three years of Pac-12 membership, the original starting quarterback became sidelined at various stages: Jordan Wynn in 2011, Wynn again in 2012 and Wilson in 2013. Kendal Thompson was injured during a game he started vs. Oregon in November 2014, after taking the job from Wilson. Wilson (2015) and Williams (2016) each played a full Pac-12 schedule, although Wilson missed a nonconference game. Huntley beat out Williams as the starter in 2017, but Williams made three starts in Pac-12 play in two segments when Huntley was hurt. And now Huntley will miss the remaining two conference games of his junior season. Williams lost to Stanford and USC and beat Colorado in his fill-in starts last year, with the advantage of considerable experience in comparison to Shelley. Williams had started one game for Washington, played one year for a California junior college and started a full season for the Utes, before becoming the backup QB. Shelley has played in four games this season, completing 6 of 14 passes for 99 yards. Saturday’s 38-20 loss at Arizona State (he entered with the Utes trailing 21-17) was his first appearance with the outcome in question. He went 4 of 11 for 59 yards with an interception on his last pass, as the ball was wrestled away from a Ute receiver in the end zone. Jon Hays is Utah's biggest Pac-12 success story as a fill-in quarterback. In 2011, he replaced Wynn and lost his first two starts, but then won four straight games before losing to Colorado with an opportunity to advance to the Pac-12 championship game. Hays led Utah's rally to an overtime win over Georgia Tech in the Sun Bowl, as John White finished the season with a school-record 1,519 yards rushing. In 2013, Adam Schulz's first start came in a 44-21 loss at Oregon. The Utes then lost 49-37 at Washington State and were eliminated from bowl consideration, before finishing with a 24-17 win over Colorado. 2011 – Jordan Wynn, Jon Hays. 2012 – Wynn, Hays, Travis Wilson. 2013 – Wilson, Adam Schulz. 2014 – Wilson, Kendal Thompson. 2017 – Tyler Huntley, Williams. 2018 – Huntley, Jason Shelley.